New "Commodore 64" style musics! 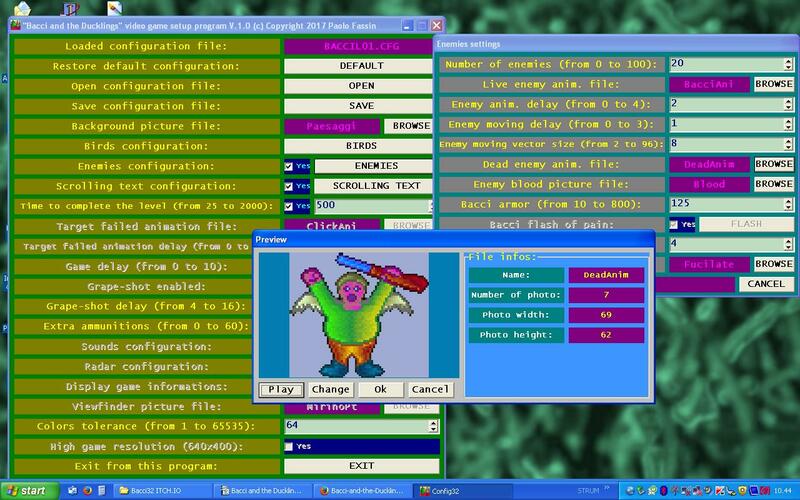 Now is possible to create up to 99 new game levels thanks to the tool Config32.EXE, that now supports GIF, JPEG and BMP Windows formats! Is also possible to change any existing level, loading new background, new bird/enemy animation and new sounds; Config32.EXE can also be used to change “Bacci and the ducklings” video-game settings. If you have just downloaded “Bacci and the ducklings” video-game you can upgrade it installing new patch BC32_P03.Exe; but if you do not know whether or not to buy this video game, you can try this demo: it's free! This file run under Windows platform for PC; requires CPU fast at least 667 MHZ, 128 MB RAM free, any video card. "From the inspiration of the well-known video game 'Operation Wolf' a new and funny video game is born.". In this video-game, BACCI is a super-equipped hunter who is in the midst of a flock of birds. The aim of the game is to shoot down all the birds, without running out of ammunition. When the number of live birds is greater than the amount of ammunition available of BACCI, he must go home with empty-handed. BACCI has available a rifle, a grape-shot and a radar. If he strikes a macroscopic letter, it will explode and it will lead to hell all the birds that are near it. Be warned, though: BACCI has some rivals; these reckless hunters, that have steal the wings from Icarus, they will try to steal the birds killed by him, after killing him like a bird. If the time available is exhausted, he must reach with great regret his wife that is waiting for him furious on 'door, but in this case he lost a bet with his friends; but if he is able to clean up the sky from all birds, she will have to cook for a whole year meat and beans, with great pleasure of her husband, who is very greedy. fact, the paths of all flying objects change to each new game. Fourteen type of flying object. Six type of characters' font. Two type of macroscopic letters: single explosive or multiple explosive. Two game-control: mouse and/or keyboard. New "Commodore 64" style musics. Capability of record a game and play the recording later. Capability of save the game and load it when needed. Managing of best score table. Two large mirrors in high resolution. More than 1000 Sprites per Screen-Frame supported. 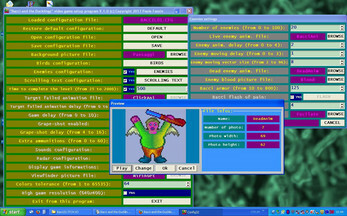 A new levels' and game settings' editor is included, that now supports GIF, JPEG and BMP Windows formats. Last update (19-11-2018) of "Bacci and the Ducklings". Just created a new LEVEL EDITOR for Bacci & D.
UPDATE to "Bacci and the Ducklings" v-game avalaible!